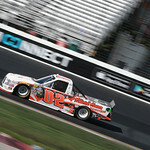 Former two-time NASCAR K&N East Series Dover International Speedway winner Austin Hill, looks to gain from his previous Monster Mile experience in Friday afternoon’s NASCAR Camping World Truck Series event. Hill, piloting the No. 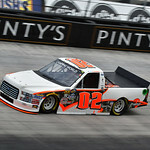 02 JRS Competition Finishes Ford F150 for Young’s Motorsports, has two previous NCWTS Dover starts, with a career best finish of 16th. 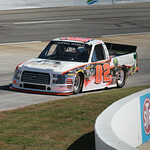 This Week’s Young’s Motorsports Ford at Dover … Austin Hill will pilot chassis No. 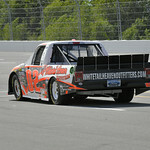 101 from the Young’s Motorsports stable. 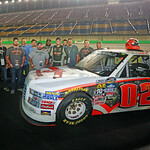 The team recently purchased the Kyle Busch Motorsports (KBM) chassis from Athenian Motorsports, where John Wes Townley piloted it to victory lane at Las Vegas Motor Speedway. Hill at Dover… In three NASCAR K&N East Series starts at Dover, Hill and his family owned team, won back-to-back races in 2013 and 2014 and were set to win a third consecutive Miles the Monster trophy in 2015, before a motor expired late in the race. Welcome JRS Competition Finishes… Providing quality paint and body work, for some of racing’s top teams, as well as custom work for the general public, JRS Competition Finishes is based out of Mooresville, N.C. Calling the Shots … Calling the shots from atop the Young’s Motorsports pit box this weekend will be veteran crew chief Bruce Cook. 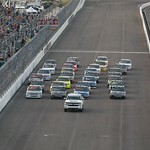 Cook, a staple in the NASCAR Xfinity Series and NASCAR Camping World Truck Series garage joined the team beginning with Hill’s first race under the Young's banner at Martinsville Speedway. Up in the Sky … Calling the shots high above Dover International Speedway this weekend will be two-time Concord Speedway NASCAR LMSC Champion and current NASCAR Monster Energy Cup Series spotter, Mike Herman Jr. Hill and Herman previously worked together throughout his NASCAR K&N Pro Series East career, including both of his wins at Dover. Catch the Action … Flag-to-flag coverage of the Bar Harbor 200 will be televised on FoxSports 1 beginning at 5:30 p.m. Eastern Time on Friday, June 2, and broadcast live on the Motor Racing Network and Sirius XM Satellite Radio beginning at 5:30 p.m. ET.